Picture a 13 year old short boy on a soccer field. He is playing defense during a tough tournament game. The score is 1-1; the teams are equal in strength and energized to score the winning goal. 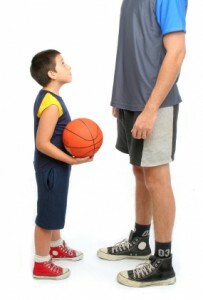 The opponent he has been assigned to mark is tall for his age, and towers at least a foot higher than him. On the sideline, I joke with one of the other parents that these two boys standing side by side in the distance look like father and son with the height difference. Suddenly, there is a breakaway. The ball is kicked from mid-field and comes in high; I see the agile short defender stoop and spring vertically, stretching his body up into the air, trying to head the ball away. The tall boy also goes for the ball and easily makes contact with it, nudging it towards the goal posts. He chases it and is about to take a shot at goal when the defender aggressively clears it away with so much force that both of them tumble to the ground. There are cheers from the parents at the sideline and a few words of encouragement from the coach. The defender is my son Eric; I have been proudly watching him play the game since he was four years old. Many kids at this age have started sprouting; however, my family has not had anyone reach a height greater than 5 ft. 3 in. for a few generations. Growing pains are not a genetic concern! This vignette gives you a picture of my son’s focus and attitude. He does not let his stature get in the way of following his passion for sports. He uses his skills and his perceptions to play smart, and it impresses me and makes me chuckle when I see him trying to head the ball when an opponent looms over him. One of the great things about kids is that they can teach adults “stuff”. Stuff we knew when we were kids, but the gentle erosion of life’s challenges can leave us cynical and diminish the “can do” attitude. Last year, I had a gentle reminder when Eric announced that he wanted to try out for the school basketball team. My first instinct was to frown, “go negative”, and try and convince him to choose a school sport where he could be more successful. He went to try-out anyway, and came home elated, telling us that he had been accepted onto the team. When I attended his games, I could see that he was focused, highly energetic, and played smart. He gave 100%, even though playing against his many “towering opponents” was an obvious challenge. The year has come and gone, and it was with surprise for me and delight for him when he came home with the announcement that his basketball coach awarded him with the “Most Valuable Player” medal at the end of the school year. His attitude and dedication had once again prevailed. I had an opportunity to reflect on my own attitude and recalibrate myself for focusing on challenges rather than strengths. Research has shown that attitude is a critical employee component along with experience and qualifications. Over my nearly 30 years experience in three different engineering careers, I have met many remarkable people. A good job for me includes having coworkers who I respect and trust, and who are wired to help each other succeed. I have had some tough jobs, both physically and mentally, however when I reflect back into the past, I remember all the great people who made life rewarding. A director I reported to a few years ago had an infectious positive attitude. No matter how bad things got, no matter how frustrated we got, he would bring optimism. Research has shown that successful employees do not just have experience and qualifications; they also bring a healthy attitude to the workplace. I have heard speakers talk about the ideal employee being made up of 70% attitude and 30% experience and qualifications. These types of statistics are always questionable, but the bottom line is that hiring people with the correct type of attitude is as important a consideration as qualifications and technical ability. Hiring employees with an empowering attitude, combined with experience and qualifications, is a worthwhile endeavor. What can happen if you take the time to hire people with a workplace empowering attitudes? How do you hire people with healthy attitudes? 1. Describe a situation where you made your coworkers laugh. 2. Picture a heated conflict situation you have been in. Explain how you dealt with this situation and what the outcome was. 3. Describe fun activities you have had with coworkers outside the workplace. 4. What character traits would your ideal boss have? 5. What aspects of your communication skills would you like to improve on and why? 6. Give me an example of a time you felt that your interaction with a coworker or boss did not go well? 7. In your opinion what makes a great workplace? 8. What personal development training have you volunteered for in the last 5 years and why?